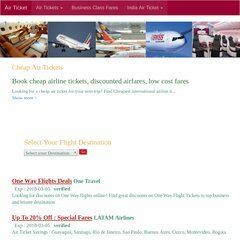 Topics: Business Fares, Asia Tickets, India Air Ticket, Airport Codes, and India Tickets. air-ticket.us Flights to India & Travel to India Cheap Air Tickets to India ..
air-ticket.us US Airport Codes, Three Letter Airport City Code Identifiers ..
air-ticket.us Cheap Flights to Italy & lowest fares to Florence,Milan,Naples .. The estimated 108 daily visitors, each view 1.30 pages on average. ns1.sitesouth.com, and ns2.sitesouth.com are its DNS Nameservers. The programming language environment is PHP/5.4.12. It is hosted by Sitesouth Llc (Georgia, Atlanta,) using Apache web server. PING www. (208.73.221.222) 56(84) bytes of data. A ping speed test response, is timed at 56.5 ms.